SAM's League was set up by Emily Osborne and her friends Sophie Smith, Danielle Walker and Jo Pleven when they realised that a lot of shows were offering Low Height Option (LHO) for Large dogs but not for Small and Medium. The League specifically supports dogs who measure Small and Medium at Kennel Club competitions and Toy and Midi at UKA shows. We now have nearly 700 members and it’s taken off far more than I expected! I have been running my dogs and judging agility for over five years now. in 2014 I semi-retired my G6 Small dog Honey to running Anysize, following an operation on her back legs, despite both her vet and physio saying she could go back to agility properly. 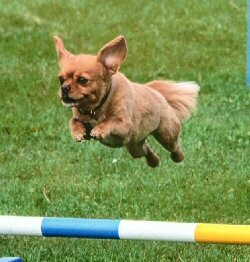 Honey still loved agility but hated the full height jumps and we were a bit fed of doing Anysize and getting nowhere against much larger dogs. Then LHO came out and we thought we'd give it a try. Honey officially has her agility mojo back and has been enjoying her runs at LHO. She even has a win towards Grade 7. But these runs are few and far between for Smalls and Mediums. Many shows are only supporting LHO for Large dogs, so we don't always get to run LHO. Since LHO came out I've made many friends in the same situation for all number of reasons. I decided to to start a page on Facebook called Small and Medium LHO Supporters' where we post shows offering LHO and chat about our dogs. It has been hugely popular. Then I decided we needed something more interesting, something to prove to show organisers that we want LHO so I set up with the help of my friends Sophie Smith, Danielle Walker and Jo Plevin. Thus SAM's (Small and Medium) LHO League was born. An opportunity to run at our final at Blenheim DTC in September, judged by Kenny Waddell. Members can post results from KC shows, UKA and independents. The league now has 60 members and the supporters page has over 400 members. This league is open to all Small and Medium dogs that run at LHO in the UK. The year of the league will run from 1st January to 31st December 2017. All members are required to provide a valid email address and to agree to the rules listed within this document. Once membership is paid, this rules document and the results template will be emailed to the email address provided. It is each member’s responsibility to submit their results. You will need to submit your results by emailing them to lholeague@gmail.com including dogs name and reference number (which will be given to you when you join), the classes and results you have had and the name and type of show (i.e. KC, UKA or independent). Where possible please also submit proof of your results. Winners scores will be checked at the end of the year. The joining fee is £3.50 per dog. This pays for your membership of this coming year's league ONLY. You will also need to pay a small entry fee for the League final, to be held 9th September at Blenheim ATC Open Agility Test. You will be asked to join/pay again for the 2018 league. Payment method for fees is by bank transfer (personal online banking or in person at your bank), cheque, or Paypal via friends and family (address to be provided via email). If you are joining part way through year full membership is still payable, results will be backdated. You must be a member and have paid your subscription before you will be added to the league. Novice - KC grades 1-4, UKA Beginners and Novice, and anyone who has not yet competed at an affiliated show. You must sign up at your highest grade, e.g. if you dog is KC Grade 1 and UKA Senior you will qualify as Advanced in this League. The above categories will be further split into Small and Medium, creating four leagues. Points will be awarded for places (up to 8th) and unplaced clears. Places with faults, places with time faults, and NFC runs do not count. Places lower than 8th will be counted as unplaced clears. Points will be awarded for standard agility and jumping classes. Specials, casual/anysize, steeplechase and games runs DO NOT count. Results may be submitted for KC shows, UKA shows and independent shows, but ONLY shows that are offering LHO for Smalls AND Mediums. Runs at full height do not qualify. Small dogs must run at 300mm or less, and medium dogs at 400mm or less. Please email to ask if you are not sure whether a show or particular class should count. At the end of the year, prizes will be awarded to the top five dogs in each category/height. with the highest accumulated points. All results must be submitted by 31st January in the year following the league end. I reserve the right to amend these rules, and would be very happy to receive comments from members on the formulation of the league rules, or any other aspect of this site. And the final rule... be nice to your dog and enjoy your agility!